As is common knowledge, diet plays an important role in the overall well being and health of any living individual. As it is for humans, Golden Retrievers do need a good and well-balanced diet for your Golden Retriever to function at their optimum best. Their outer appearance, their moods and temperament, their appetite and physical health is all decided as per the nature of the diet you, as an owner, provide them. 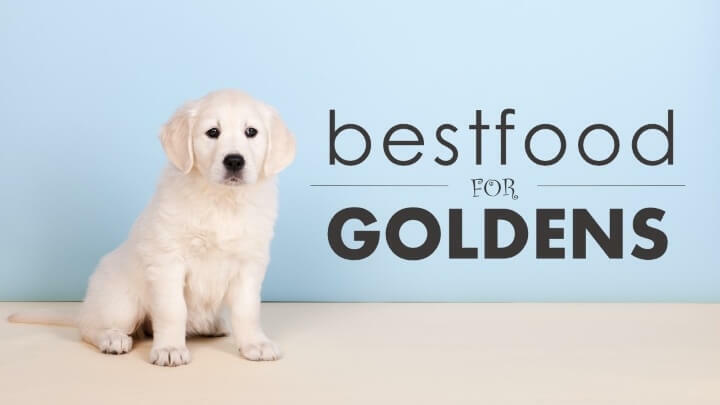 Given in this article below is a detailed methodology in order to help you decide the best diet for your Golden Retriever and a guide on feeding Golden Retriever puppies. Read on to know more about it and to understand what to feed your dog and why. This goes without saying. Especially when speaking of a Golden Retriever pup, one needs to take extra care to see if it is being given all the energy requirements needed to grow and develop well into a fully-grown dog. Include everything that is on the list of the Golden Retriever like fresh fruits and meat. Chapatis can be given, but not bread or breadcrumbs. Any food item that adds no value to your dog’s appetite must be completely skipped and negated. Antioxidants are known to slow down the process of ageing. In other words, feeding your dog a diet rich in antioxidants is bound to give them a glossier coat, a good appetite, and a bounce in their step like never before. Also, a diet full of vitamins and minerals will keep their overall health in check. Red meat protein is needed for the proper growth and development of their body. Supply all these nutritional requirements to them in the desired quantities, and your dog’s diet will be the best in terms of nourishment. It is in every dog’s nature to chew on bones and gnaw at them. Allow your Golden Retriever to do the same. Chewing on bones will give them all the nourishment they need, naturally. Also, the friction caused by chewing on bones will naturally and automatically cleanse your dog’s teeth without you having to worry about it. True that you can brush their teeth yourself, but nature has its own way of dealing with things, and this is one of them. Feeding Golden Retriever puppies is a challenge, and chewing bones is a good alternative for them. Do this on a daily basis and see your dog’s health developing in the best way. True that commercial foods do claim to contain all essential nutrients specially to suffice a growing dog’s nutritional needs, it is best to not rely on them completely. Although you can use these foods daily to satisfy your dog’s taste buds, don’t rely on them completely. You can use homemade foodstuffs to feed your dog as per their requirements. Make sure that the meat is raw and not cooked. There are many recipes you can use to serve your dog a good homemade meal along with commercially available foodstuffs. This may also result in obesity in Golden Retriever. Junk food and scraps are never nutritionally healthy for your dog. All they do is satiate your dog’s tummy so that his hunger is famished but add no value or nourishment whatsoever. It is best to keep such scrap like breadcrumbs and stale food away from your dog’s palate if you wish to see it grow and develop well. Make sure that you take your family, friends, and relatives on board with this so that they don’t feed your dog such foods even unknowingly. It is best if all family members work together in monitoring your dog’s diet. The above-mentioned ways are not all when it comes to dealing with your Golden Retriever’s diet. You can add a lot more variety to it and can even customize your dog’s eatables to ensure that the eat well and eat good. Remember, like humans, even dogs have their own choices and preferences. Study your dog’s choices and serve them their diet accordingly. However, don’t go on to overfeed them as this may result in obesity in Golden Retriever. Keep them well-fed and physically active and watch them grow into beautiful dogs.